Back in 2010, Michael Mealing began to consider a spacecraft mission to capture and return a very small Near Earth Object (NEO) to the ISS or Bigelow module for study. He writes about business concept here. Michael’s point, humanity will only travel into the solar system if they can make money at each step. NEOs may be the next step after LEO. Then in January, 2011, the topic of a NEO capture and return to LEO comes up again in the comment discussions on the Space Business Blog here. So Michael and I have teamed up to continue refining this business concept. 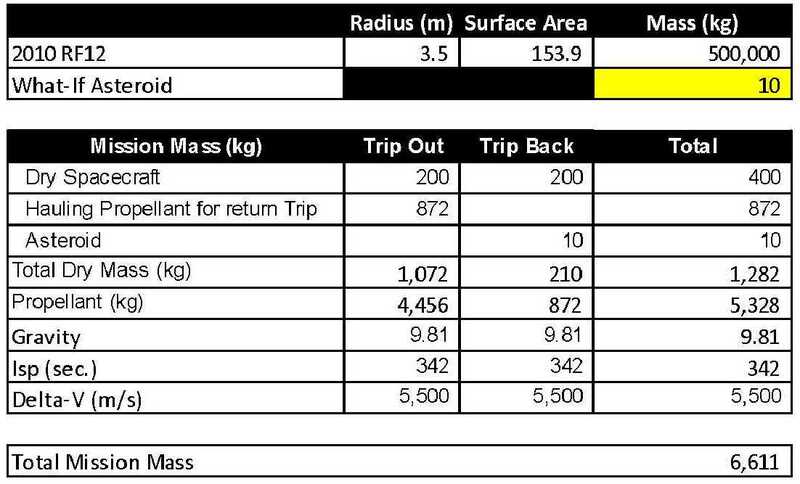 Here’s a Pencast describing the basic concept for a mission to return a small asteroid sample to a space station in LEO. I also include a few markets that might make such a mission profitable. Moon dust legally for sale - $50K for a few small specs. Next, I will walk you through the spreadsheet model built to analyze what would be required for a mission like the one described in the Pencast above. Spacecraft launched to LEO Space station to standby until target asteroid has been identified. Spacecraft launched from LEO space station and returning to LEO space station. Haul all propellant for round trip (no refueling). A duplicate amount of Delta-V will be required for both the trip out to the asteroid and the trip from the asteroid back to a LEO space station (assuming NO aerobraking to avoid damaging asteroid). Note: The mission’s costs could be greatly reduced if one could determine a smart engineering method to reduce the needed delta-v for the return trip to a LEO space station. Mass of dry spacecraft: 200Kg (Similar to NEAP but swap out all of NEAP's science gear for some type of grappling mechanism). Engine efficiency Isp = 342 seconds. Although spacecraft is docked to LEO space station before mission start, this model assumes no propellant boil-off or LOX top-off prior to mission start. Since the target NEO is still undetermined, multiple Delta-V’s were modeled to reach NEO targets. Delta-V’s between 5500, 4500, 3500, and 2500 m/s were considered. 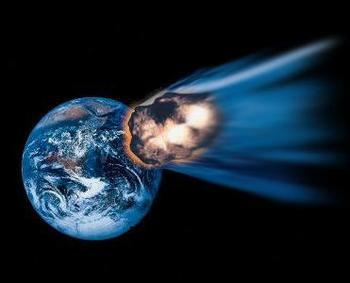 Asteroid 2010 RF12 has a radius of 3.5m and a mass of 500,000kg according to NASA. Prorating these values to a radius of 0.5m gives you a sphere slightly smaller than the desired “refrigerator” in Michael Mealing’s earlier posts with a mass of 71,429Kg. This mass is larger than what I wanted to consider for a proof of concept mission, so although I include the 71K Kg mass in the analysis, I focus on target asteroid masses of 500, 300, 100, 50, 25, and 10Kg. The table below is the summary of my analysis. The columns in the table below represent the multiple delta-v’s modeled for our 200Kg spacecraft to travel from a LEO space station and AR&D with the target NEO. The rows are the various NEO masses that were considered (or – how big of a rock the mission can go out and get). The data populated (the cells with numbers) are the total mission masses for each combination of delta-v and NEO mass. The total mission mass includes all propellant needed not only to reach the NEO but to return it to LEO as well. The color coding correlates to the launch vehicle table below – Dnepr in green, Falcon 9 in orange, and Falcon Heavy in purple. Finding low delta-v targets will dramatically increase the size of the asteroid one could successfully return. 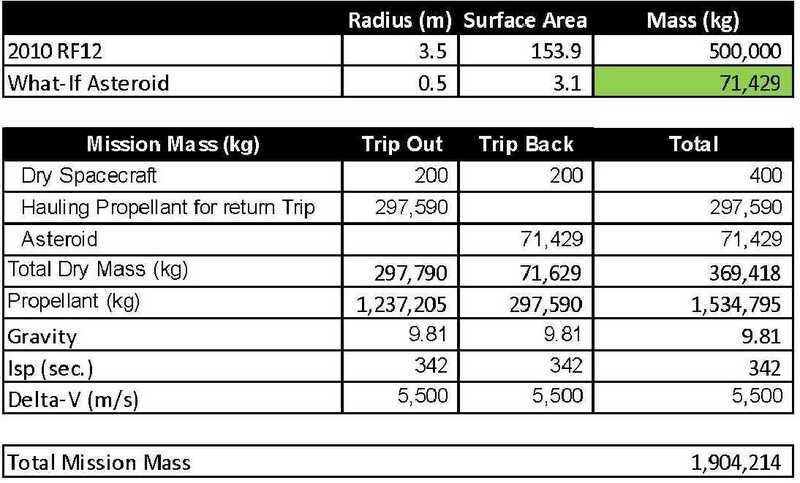 For example, instead of a 10Kg target at 5,000m/s of delta-v, the same spacecraft could return a 500Kg target if only 2500m/s of delta-v were needed to reach it (and at almost half the total mission mass!) – that is a lot more rock for scientists to analyze – 500kg instead of 10kg. Are there ways to decrease the delta-v required to reach these targets or return from them (currently avoiding aerobraking, but maybe a small asteroid could be shielded during aerobraking)? Because such small NEO objects will be difficult to spot a head of time (there are many more NEOs than we have on record - especially small ones), such a mission has to be very patient waiting on station many months/years for the “perfect” NEO to approach with the right blend of low delta-v and a mass that is “just right”. And to respond to new targets, the mission must be ready to depart the station on very short notice in pursuit of any newly identified targets. Growing humanity’s knowledge of very small NEOs increases the chances of mission success. Here is an example of the tables I built to analyze propellant needs. Here are the tables feeding the 5500 m/s of delta-v column. The colored cell in each table varies the asteroid masses. 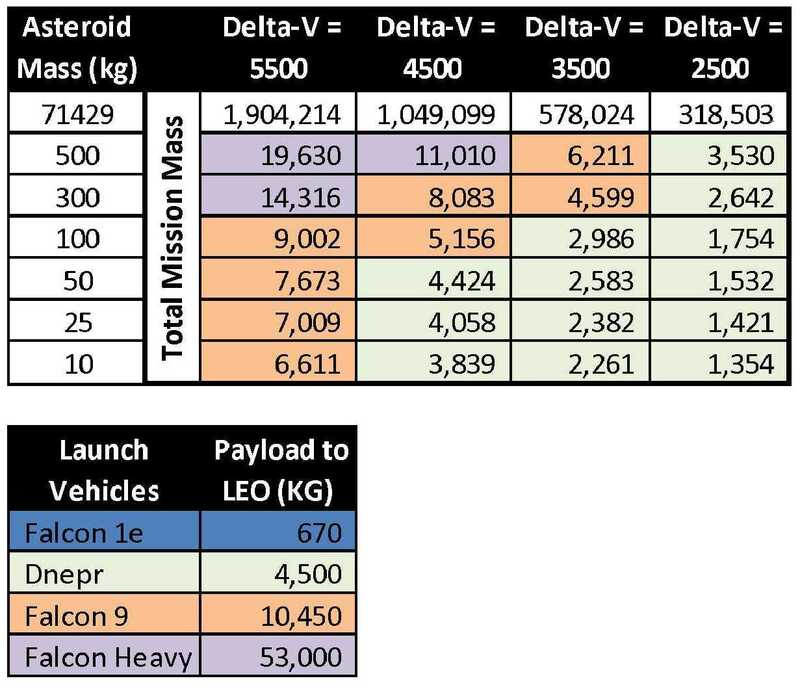 Here is the interactive spreadsheet for those that want to modify my assumptions and want to view the tables for the delta-V's modeled as well. Michael and I plan to refine this concept over the coming months. Look for follow-up posts here on SBB and over on Michael’s blog.